Ooo la la! 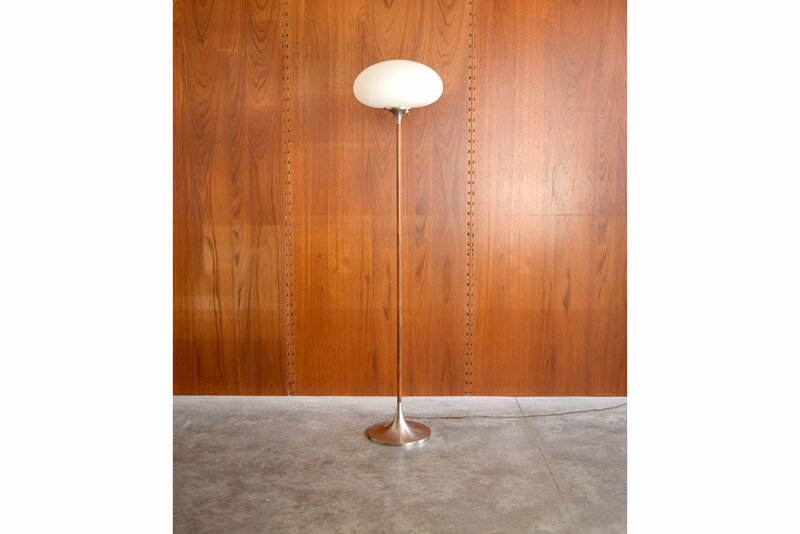 This is Laurel Lamps Company’s sought-after and iconic ‘mushroom’ or ‘tulip’ floor lamp, in a very unusual and elegant color combination. The base and top are spun aluminum, with a thin rosewood/walnut veneered iron stem between, improbably supporting the frosted glass globe. A 3-position switch allows different lighting levels. Stunning in person, especially when lit! This piece retains its original Italian glass shade, very unusual to find these days.It is in excellent vintage condition with only very minor signs of age. Retains Laurel Lamp Co. label. 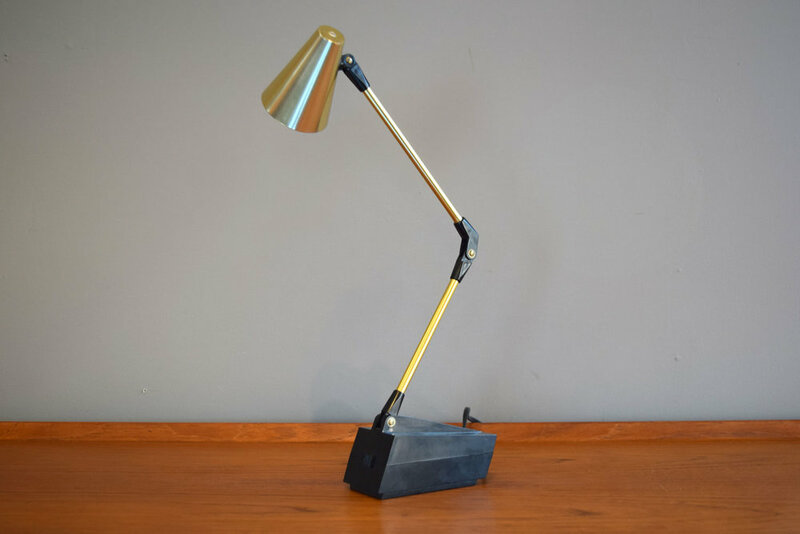 Laurel Lamp Company made some of the most sought-after mid-century lamps. 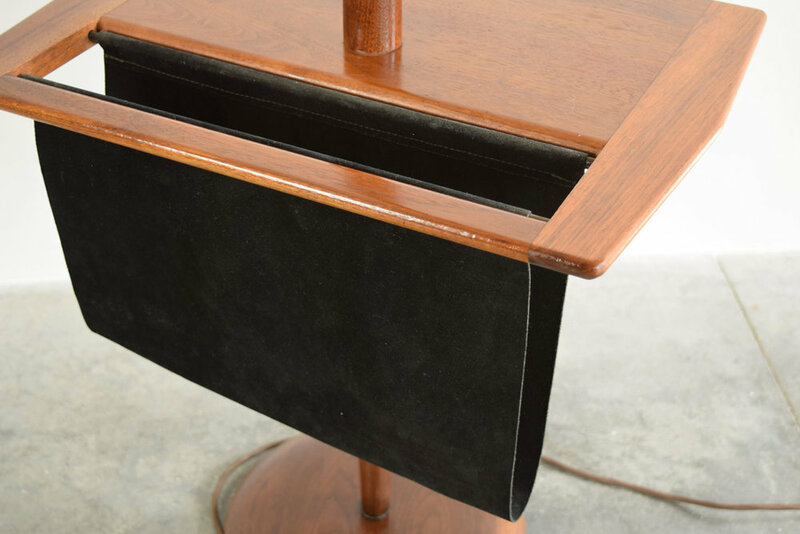 This is a rare variant of their classic table floor lamp, with the addition of a black suede storage sling for magazines, laptops, or books. We love the original fabric covered cord and step-on floor switch! This lamp is in very good vintage condition. 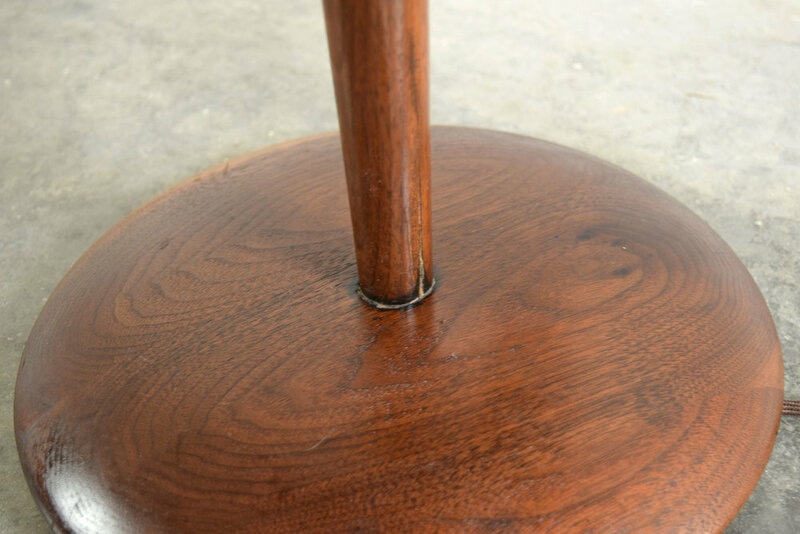 The base has a few scratches and dings, and the walnut stem has an old repaired crack at the bottom. Shade included if desired. 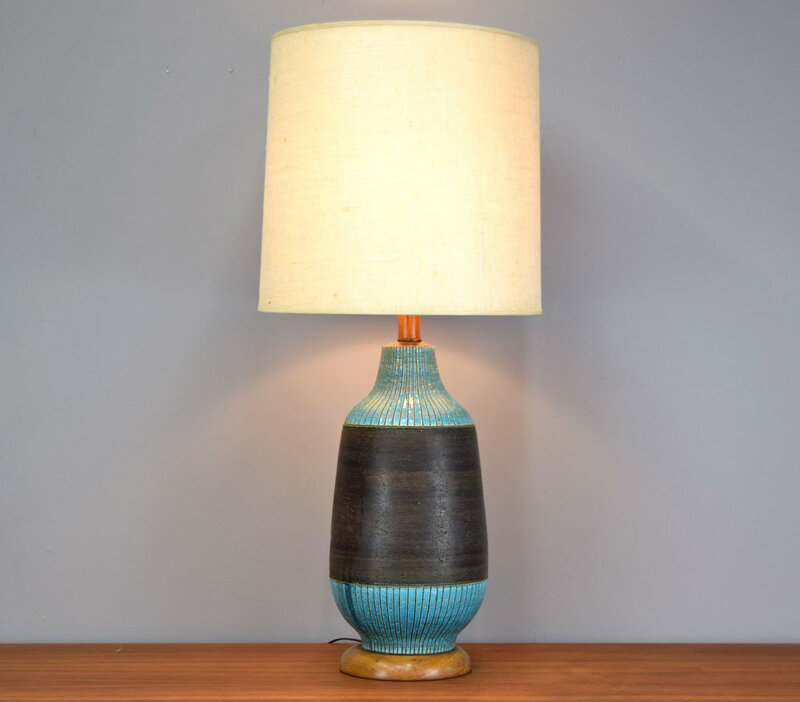 A beautiful large signed ceramic and teak table lamp by highly collectible Gordon & Jane Martz for Marshall Studios. Ceramic barrel bottle-form has great presence and is complemented by a perfectly proportioned solid teak neck. Hand-detailed sgraffito-style glaze is organic and beautiful. “Martz” signature, done in the artist’s hand is on the back. Excellent vintage condition. It appears to have had the light socket replaced at some point. 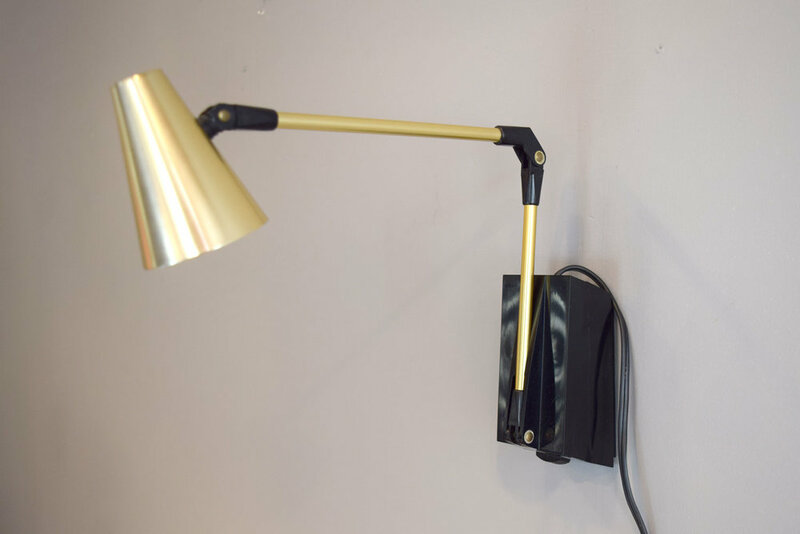 This is a little lamp with a BIG personality! 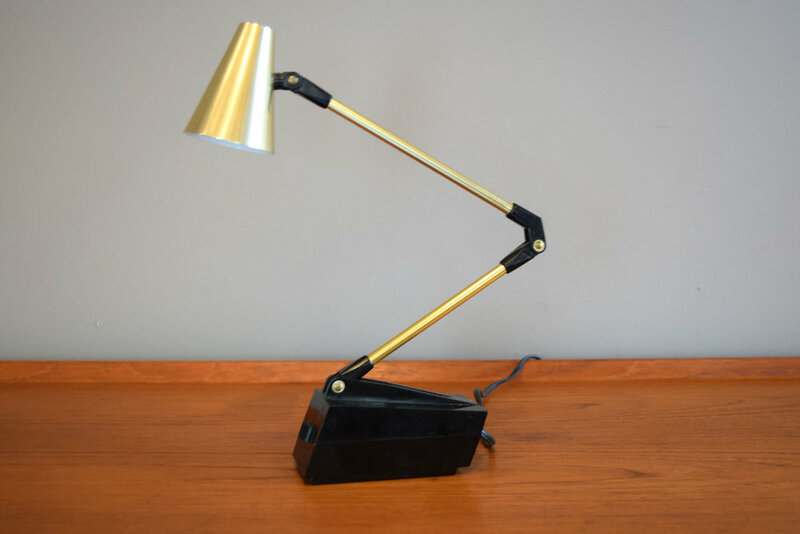 In the manner of Pixar’s Luxo Lamp short film, this adorable guy has real attitude. He can sit on a desk or be hung on the wall, and is extremely adjustable. Provides concentrated high intensity light equivalent 100-200 watts from a thumb size GE bulb. Reflector swivels 180 degrees, fold-a-way extension arm has 3 joints. Model 7100 “Princess Lite”. 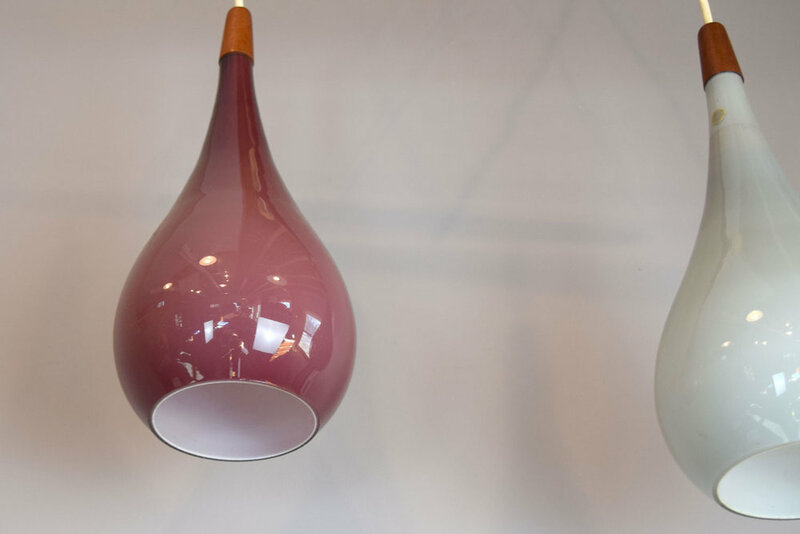 Gorgeous mouthblown cased glass pendants in pale eggplant and gray, suspended from a teak stretcher. In the style of Holmegaard or Uno and Östen Kristiansson for Luxus. These are marked with a “Made in Sweden” sticker and brand on the cork plug. Includes the original ceiling cap. In excellent vintage condition. The gray lamp has a small chip on the rim. If you would like us to re-wire this lamp with longer cords, please inquire for pricing. A wonderful space age chrome orb ‘Eyeball’ lamp by the noted designer Robert Sonneman for George Kovacs. Features an adjustable chrome stem as well as an adjustable globular head, and a heavy weighted base in textured steel. In very good vintage condition with light wear as shown in the photos. Brass is back, baby! This is a spectacular pair of early 1970s table lamps designed by Erwin Lambeth. 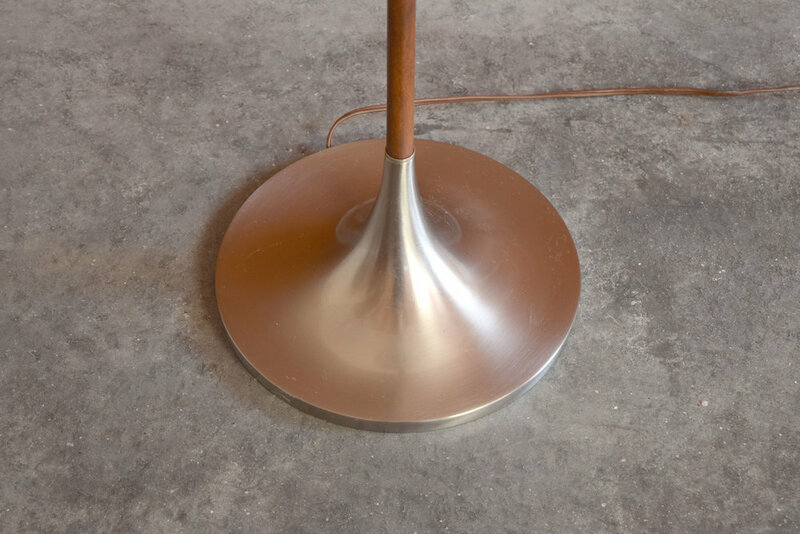 These lamps are often attributed to designer Pierre Cardin, since the shape echoes his logo. They are cast in very heavy solid brass and are quite substantial. 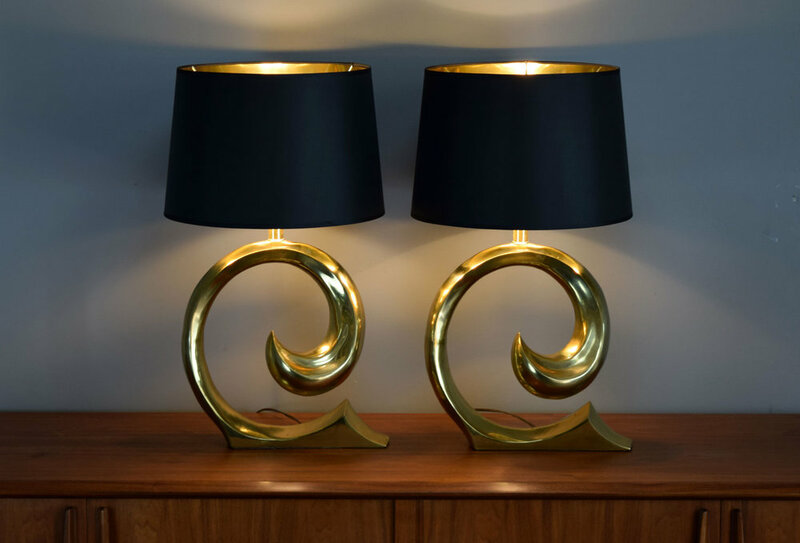 We've paired them with new gold-lined black cotton/linen blend lampshades are they are just wonderful. In excellent vintage condition. 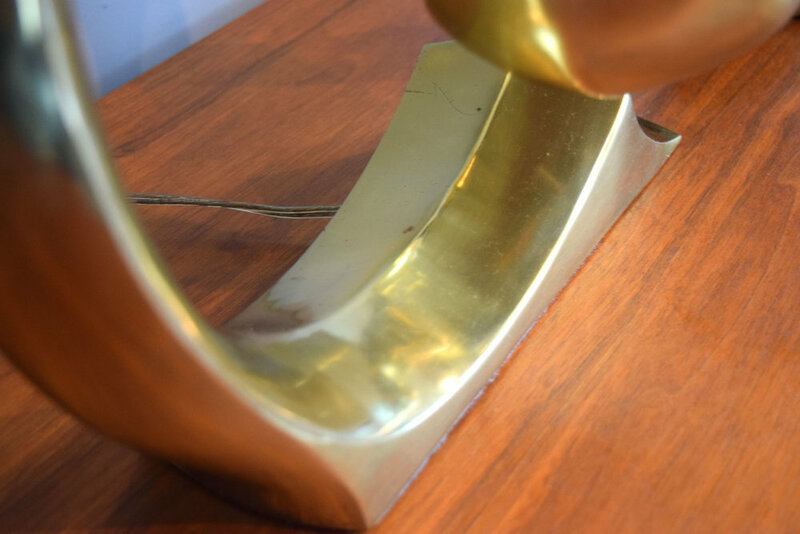 There is some light lacquer loss as shown, but since they are solid brass, they could easily be stripped and re-lacquered if desired. We like them just as is! 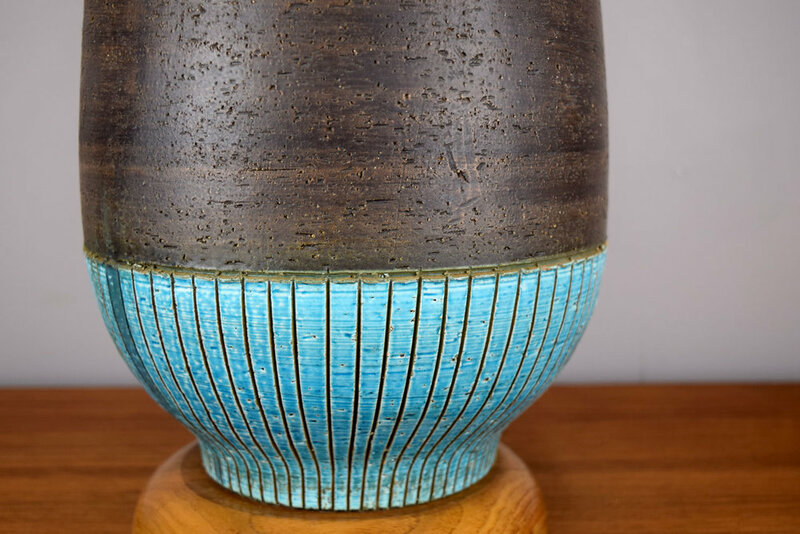 A very large vase-form lamp with “Rimini Blue” glaze and incised stripe motif by Aldo Londi for Bitossi. Wilmar Lamp Company. Body is of subtly textured brown pottery with a glossy cerulean glaze hand-incised with vertical stripes. Excellent vintage condition. Light finish wear to walnut base. New harp. 9" diameter base x 34" tall overall. A wonderful cylindrical heavy teak lamp. There is some slight separation to the joints as shown. The original burlap shade is included if desired: it has some cracks to the inner liner as shown.